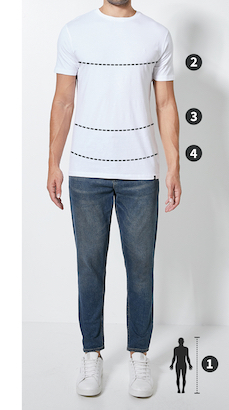 Please note that Superbalist men’s tops are designed to fit the following measurements. Some brands may vary from these measurements but the table can still be used as a guide. To determine your chest size, wrap a measuring tape around your chest at its fullest area and round the measurement to the nearest whole number. No flexing! Wrap the measuring tape around the lower part of your neck, an inch below your Adam’s Apple. To ensure comfort place 2 fingers between the tape and your neck and then round the measurement up to the next half. Keep it plain and simple with a classic crew neck tee. No wardrobe is complete without one, and this bright colour makes for the perfect addition to your summer rotation. Team it with dark jeans or your favourite shorts.